Shoe inserts and arch supports can help people from all walks of life, whether they are workers who stand on their feet most of the day, children, grandparents, athletes, or people that want to reliev e or prevent pain and soreness affecting their feet, legs, knees, lower back, hips and even their neck. The proper foot support can make all the difference in the world. Since most shoes are designed to fit the masses, your foot is not properly supported and is adjusting to the insole of your shoe. 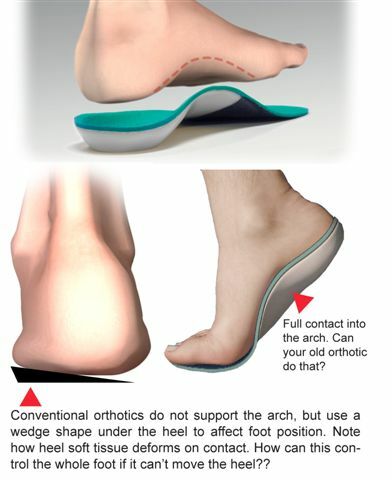 Think of an arch support or accommodative insert as a device that is designed to fill the space between your foot and the shoe, providing proper support and alignment. Think of the bottom of your foot as the foundation of your body. The foot must be in proper alignment and balance to support the rest of your body correctly. In fact if your foot is not in alignment it can and will throw the rest of your body out of alignment causing poor posture and pain in the ankles, knees, lower back, and even the neck. Please come in for an appointment so we can get you fitted with custom arch supports today!